A Happy Carrot: Actual Cinnamon Rolls? Seriously? So......after two posts and lots of writing (and baking, and eating) of/about cinnamon roll bread recently, and how I wanted the taste with less effort than actually making cinnamon rolls...my 11 year old daughter (remember her from the yeast toot story?) called me from school yesterday to inform me that she volunteered me to bring at least 35 cinnamon rolls to her class this morning. I am not joking. They've been doing state testing all week, and before they start their test, they get a treat. Now, I basically think that when you become a parent, these types of moments come with the gig. Like how a few weeks ago she told me at 4 pm that her state project was due the next morning. But honestly, that rarely happens with this kid. She's super responsible when it comes to school work. Anyway, I was busy and didn't get home until late. 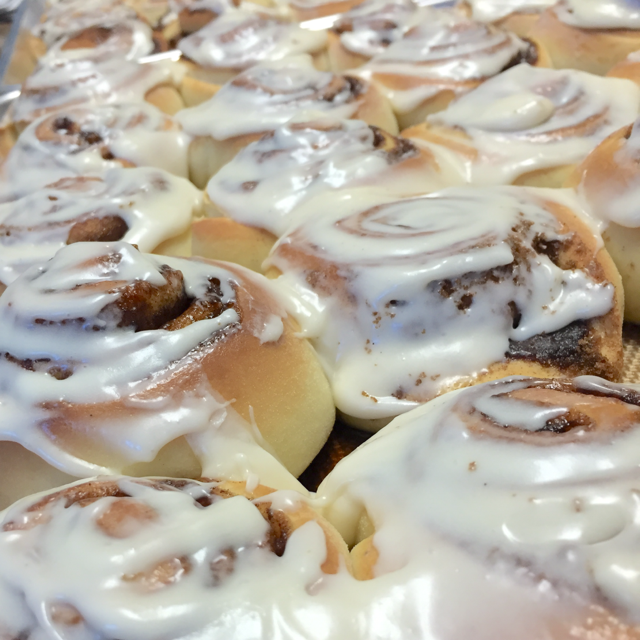 So...to make cinnamon rolls late at night or early in the morning? Ugh. I chose morning, even though I'm pretty much semi-catatonic until noon every day. And I couldn't buy these things, because she promised her class home-made rolls. And she talked them up. So there are expectations here. Yes, they're the expectations of 11 year-olds, but still, expectations. So all the cream cheese and bread flour and sugar (that I made sure I had on hand when developing the cinnamon roll bread) has come in handy. And even though I've made countless loaves of the bread in an effort to not have to go to the effort of actually making cinnamon rolls, it looks like I had to end up making the real deal (40 of the real deal) anyway. Man, I had to get all fancy and stuff and actually make frosting and physically frost each roll. Sigh. I guess I'm lucky to have such problems. You're welcome Go-lie (11-year old's nickname). I love you. And in case you want to know, I used this recipe.